Hi there from North Texas! Recently, my husband and I returned to the family farm after a hiatus of thirty years. Well, actually, I had the hiatus. My husband is new to all this. It's almost as much fun watching him adjust to this unfamiliar lifestyle as it is watching the animals out here. We spent thirty years in the Dallas/Fort Worth "metroplex" raising our four kids. Now we've reached the age where our parents need help. So here we are; semi-retired, kids grown, tottering parents. Just to liven the mix, we recently added twenty chickens and two geese. I concentrated on five heritage breeds of chickens for their gentleness, dual purpose, and broodiness. I had chickens as a kid, but they were just general feed store variety. This time I had the luxury of selecting speciality breeds - what fun! I'm not sure how many hours I spent drooling over the old breeds with their lovely names. Folks that don't like chickens don't understand, do they? I did get one breed just for nostalgia's sake. The hen I had as a six year old kid was a lovely Buff Orpington I called Goldy. I know, very original! Goldy was such a tolerant bird. Because of her, I love chickens. She endured my hauling her everywhere without fussing. In the mornings, I'd sneak her to my bedroom until she got so heavy I had trouble lugging her up the stairs. I began sticking her in the open basket of my bicycle and giving her a slow ride around our large back yard. Suprisingly, she didn't fly out. I put her in the basket at first, but she decided to hop up on the handle bars where she would cling for a circle around the yard. It was funny to see that hen flapping and tottering for balance. I guess she liked it because Goldy never let go of the bars until we stopped. It was the closest a fat Orpington could get to flying. Nearly every day she laid a beautiful rosy brown double-yolked egg. 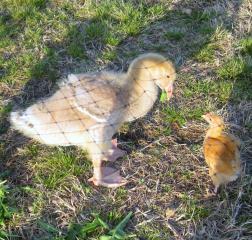 The picture is my Orpington rooster facing off against a young American Buff Goose. He stood on his tip toes, trying to impress. The geese have had amazing growth; the two birds in the picture were hatched the same day.